Hi to all Brides planning your weddings, of course, your wedding dress takes priority for you on the day and buying this should be about 6-12 months before your wedding day. Accessories such as your wedding veils, shoes, hair accessories and flowers are also really important to compliment your wedding dress and to achieve your vision for the day. To wear or not to wear a veil for your wedding is a very personal choice. 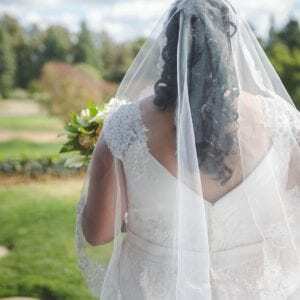 Most Mums want to see their daughter in a veil, in their day veils, were commonly worn and they often feel that the wedding dress is not complete without one. There are various lengths to choose from, the most popular are the fingertip (75cms), knee (120cms) and Chapel (280cms) or Cathedral (300cms) length. All of these will be stocked by your Bridal shop. 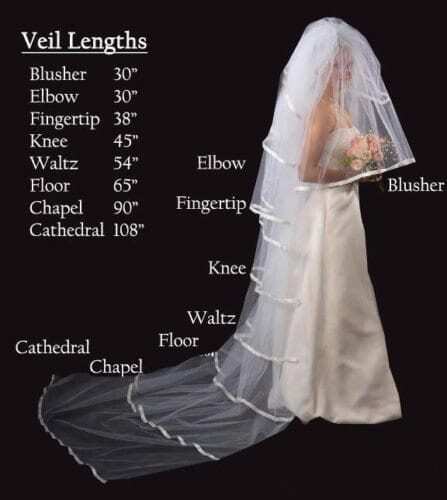 One point to remember is that if you choose to have a long veil and have a dress with a train you will need to go for a Cathedral length veil to cover the train. Edgings for wedding veils have an impact on the cost of the veil, for example, diamante or lace will mean a more expensive veil. Your veil should definitely compliment and not compete with your dress. It is true that the thicker the veil the lower the quality. A see-through light wedding veil is of a higher quality. Personally, I love veils, for me, they do complete the wedding dress, frame and flatter the bridal silhouette. Wedding Veils can also cover the top of your arms, particularly valuable if you don’t like your arms and don’t want to show them. Instead of a veil, there is the option of a ‘Birdcage’ veil, these are very short and just cover the face, usually placed at an angle and anchored towards the back of your hairline. A Birdcage looks best with short hair and is particularly appropriate for vintage style weddings. Ooooh, we all love shoes don’t we, well most of us do. The fashion at the moment though is for a flatter shoe and indeed Converse are the most popular type. I have seen some that are covered in glitter bringing fun poking out from under the dress. There are many, many shoes to pick from, I would recommend ‘Rainbow’ shoes which are specialist wedding shoes and are known for their comfort. Whatever the style you choose, heels or flat be sure that your shoes are comfortable. You will need to put your shoes on about 2 hours before the time you get married and wear them till bedtime, this could be 12-14 hours, a long time to wear even the most comfortable shoes. Why not take another pair with you just to change into, they can easily be taken to the venue the day before. There is nothing worse than aching feet on your special day. Again there are so many types of hair accessories to choose from, the decision on the style and type does include whether you are wearing a veil or not. If you are then the hair accessory needs to compliment the veil yet should look great on its own when the veil is removed after the wedding meal. 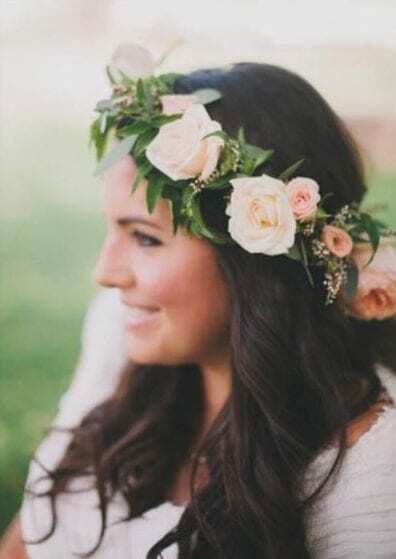 Flowers in your hair are very popular again, these can be a circle or a small bunch of Gypsophilia, for example, looks so pretty. 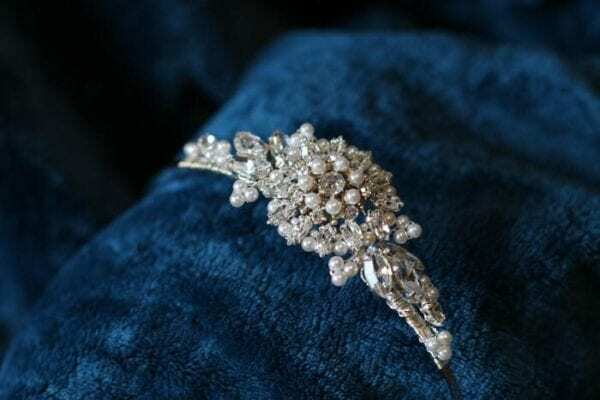 On the other hand, a diamante or pearl clip or hair band look so effective and a lovely keepsake of your wedding day. Flowers are so important to your wedding day. They usually include bridal bouquet, bridesmaids’ flowers, groom and groomsmen’s buttonholes, Mother and Mother in law’s corsages, also flowers as a hair accessory if that’s what you choose. There are also flowers for the church or venue and thank you flowers for Mum and Mum in law the day after the wedding. All very expensive. It’s a great idea to be very clear on what you want. What type and colour of flower, the size and shape of your bouquet and the size and flower for the buttonholes and corsages. The flowers for the church or venue are optional but an excellent addition to add to the atmosphere. Many florists do packages and the price will depend on the flowers available at the time of year. Do your homework on the florists and visit several to understand their experience of weddings not just of flower bouquets. Get recommendations from other brides and read reviews online. Also, ask them to do a dummy run of the bride’s bouquet, don’t be embarrassed to take along a photo of what you want. Also be very clear on when and where you want the different flowers to be delivered such as your house or hotel, the grooms for the buttonholes and the venue. Visit our wedding dress accessories page to see a full range of the brands I stock, including our wedding veils. Follow us on Twitter, Instagram and review us on Yelp.